Is there life in them thar Martian pits? 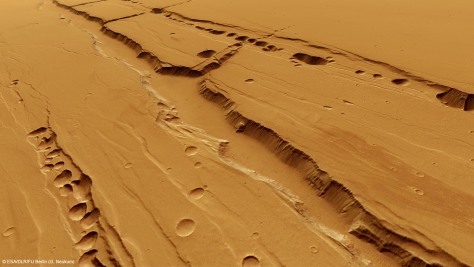 The Martian region known as Tractus Catena is shown here in a computer-generated perspective view. The image was created using data obtained from the High-Resolution Stereo Camera on the European Space Agency's Mars Express spacecraft. The pits seen in the background show hints of layered bedrock in the upper walls of each depression.